This lighthouse in St. Augustine, Florida, was built in the 1600s by Spanish settlers. By 1824, it was an official US lighthouse, and was later replaced by the current lighthouse, located about a quarter mile away. The original suffered a tragedy when Mr. Andreu, the lighthouse keeper, fell to his death while painting the tower. When the lighthouse was being built there was a dispute over property and one of the parties involved, Dr. Ballard, is now rumored to haunt the place, along with the ghost of poor Mr. Andreu. The parade of lost souls doesn’t end there, however. When the Keeper’s House was being rented out for apartments, many tenants reported strange noises and seeing a young girl walking around. A keeper in the 1950’s even refused to live in the house, trading his living quarters to a Coast Guardsman stationed on-site. There is the mysterious Man In Blue who haunts the basement, and employees of a gift shop located in the house attributed objects being moved and noises being made to local poltergeist, Andrew. And the tower, itself, is rife with footsteps and disembodied voices. Many visitors and others believe that the lighthouse and surrounding buildings have a history of paranormal activity. Allegedly, visitors and workers have seen moving shadows, heard voices and unexplained sounds, and seen the figures of two little girls standing on the lighthouse catwalk (who purportedly were daughters of Hezekiah Pittee, Superintendent of Lighthouse Construction, during the 1870s; the girls drowned in an accident during the building of the tower). Other reports are of a woman seen on the lighthouse stairway or walking in the yard outside the buildings, and the figure of a man who roams the basement, or the unexplained smell of cigar smoke. The male figure is said to possibly be Civil War hero and former lighthouse keeper William A. Harn. Stories like these have led The Atlantic Paranormal Society (TAPS) to the site, where they shot an episode of the Syfy show Ghost Hunters. During this episode, TAPS claims to have captured a few mysterious incidents on video, such as the disembodied voice of a woman crying "help me", and a shadowy figure moving about the stairs above them. 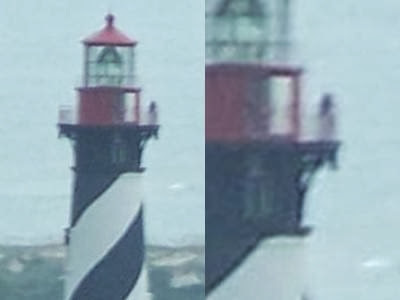 One of their DVR cameras also captured what appeared to be a figure looking over the railing of the lighthouse. A TAPS member called the Lighthouse the "Mona Lisa of paranormal sites". Due to the ratings success of the first investigation, TAPS later returned for a follow-up investigation and experienced similar incidents. The lighthouse offers "Dark of the Moon" tours where visitors can tour the site at night, and get the facts about the history of those who have died on the site.